The American Staffordshire Terrier is an extremely friendly breed. It is gentle and kind when encountering strangers in their home and is wonderful around little ones. While it is a great companion for humans, it is not a dog that enjoys sharing the spotlight with other canines, making it somewhat of a problem child if they are required to reside with other animals, especially other dogs. Not a very timid breed, this terrier is a fantastic guard dog and adores nothing more than protecting its family. They are a tad stubborn and set in their ways, which usually comes with the territory when you own any good watchdog. They are an easy breed to train and also bode a lot of energy. They are commonly misunderstood as they bode that tough Bulldog appearance, but in actuality are very affectionate and loving creatures. Small in height, they can reside in a smaller environment, but do keep in mind they weigh more than the average dog their height. The single most important thing needed to successfully own a happy American Staffordshire Terrier is to permit it the time to play and run. They have a hunger for exercise and will need walked if not given the time to roam outdoors at least once per day. Able to reside in cold or warm climates, this canine is fairly easy to care for daily. Their coats are simple to maintain and they will only need a regular grooming and nail trimming when necessary. Cerebellar ataxia, CHD and PRA are all common ailments that the American Staffordshire Terrier can contract. Common minor issues they run into are overactive thyroid problems, heart disease and elbow joint difficulties. In some rare circumstances they can contract allergy symptoms and cruciate ligament rupturing as well. While CHD is mentioned as a safety precaution to watch for in some Terriers, not all have symptoms or any development of the condition at all. Testing recommended by the vet as they progress in age can involve screening for their heart, hips, eyesight, elbows and thyroid glands. Average lifespan of this breed is a healthy twelve to fourteen years long. Generally weighing an average scale of fifty five to seventy pounds, they are very muscular and playful well after their puppy years are over. 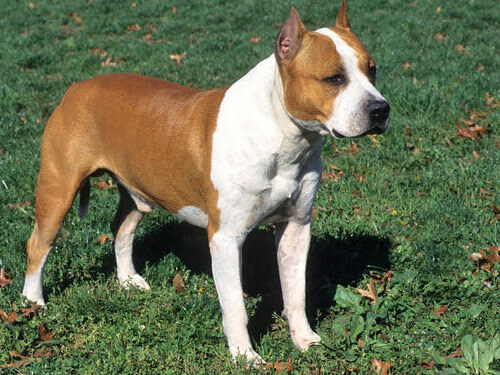 Deriving from the same bloodlines as the Bull Terrier, the American Staffordshire Terrier is a product of a breeding with a Bulldog and what experts believe an English Smooth Terrier. Once known as the Bull Terrier, they were a crowd favorite for those who enjoyed owning and watching dogs fight. They became notorious for their exceptional fighting abilities in the United States in the 18th century. Getting their nod from the AKC in 1936, they still to this day gain many fans as having that reputation for being a tough and gladiator-type canine. They have since been recognized for the fun-loving breed that they truly are and many have desired them as great household pets.